CSK vs SRH preview: Can Sunrisers stifle Super Kings? Chennai Super Kings need to be backed up by the bowlers and a re-jigging of the bowling attack may be on the cards. It is an uncommon thought for a team to greatly invest in and rely on bowling to win a T20 league. Only some teams have been able to make the ball-over-bat approach a big success. Sunrisers Hyderabad is a shining example. It has stuck to this policy for three IPL seasons now. Its consistent bowling this season has evoked a comparison with Perth Scorchers (Big Bash League), deemed the best example of this approach in recent times. Similarities are being drawn in terms of having bowling depth and defending small totals. Sunrisers’ attack will again come to the fore versus Chennai Super Kings here on Sunday in a match between the table-toppers of the Vivo IPL. Rashid Khan, by his own admission, is fixated on spot-bowling (focusing on the length). At his pace, good and short of good lengths will be difficult for the batsmen to reach. That lengths he couldn’t consistently hit when Chris Gayle (104 n.o.) and Suresh Raina (54) smashed him in consecutive matches. Analysing those performances, Rashid had reckoned he had bowled fuller than he would’ve liked to. Statistically, Rashid has been effective versus right-handers. He himself feels that he bowls the googly “much better” to them. So, Rashid versus Raina will be an interesting face-off. There’s a thing about Siddarth Kaul’s knuckle-ball. Generally, batsmen observe the bowler’s fingertips over the seam to differentiate the knuckle ball from the normal seam-up delivery — they can see them in the case of the former, and cannot in the case of the latter which is bowled with bent fingers. Sanjay Manjrekar made a point in the commentary that Kaul’s fingertips weren’t to be seen in either case. It’s something the CSK batsmen will be wary of. 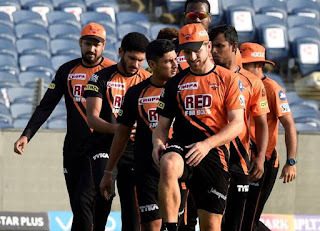 It’s also to be seen how Kaul and Bhuvneshwar Kumar approach death-bowling after being taken for runs by Rishabh Pant in Sunrisers’ last match. Kaul had boasted an economy rate of only 7 in the overs 16-20 before that match. Pant especially handled the wide full deliveries remarkably well. On Sunday, Ambati Rayudu (who hit 79 when the two sides had met earlier) will be a big threat for Sunrisers. Sunrisers coach Tom Moody on Saturday said the injured Wriddhiman Saha is unavailable for Sunday’s match. 0 Response to "CSK vs SRH preview: Can Sunrisers stifle Super Kings?"